Evening time is when I'm most likely to spend extra time on my beauty routine. In the mornings I'm rushed off of my feet trying to get reading for work, so tend to just wash my face, pop on some moisturiser and apply my makeup as quick as I can. Because when you can spend extra time in bed, why wouldn't you?! So when it comes to taking it all off at the end of the day, I like to use a few more products and spend some more time pampering myself. I recently did a poll on twitter asking you guys if you'd like to see my evening beauty routine, and the vast majority of people said they would! So for today's post I'm going to take you through everything from the moment I take off my makeup to the time I step into bed. So grab a nice cup of tea, and get settled into the sofa, as I show you my favourite products! Since about August 2014 I've been using this incredible micellar water to take off my makeup. It's so inexpensive at just £4.99 for a huge bottle and suits my sensitive skin perfectly. I'd be very surprised if you've never heard of this product as the hype surrounding it has been amazing! I like to apply this to a cotton pad and then just sweep it across my face, removing my face makeup first, then my eyebrows and then any mascara and eyeshadow. One of the reasons I love this product so much is because you can literally use it for everything, lips, eyes, face, everything! It's also totally non greasy which is fantastic as I suffer from oily skin and definitely don't need any help with moisture! Ahh the cult beauty blogger favourite! Like pretty much everyone else, I'm obsessed with this product. It's a wonderful cream formula that doesn't foam and isn't drying unlike some less expensive face cleansers. Even though it's not targeted towards breakouts, I do find that this helps keep my skin clearer, particularly because it's so gentle and doesn't irritate, but if you suffer from really bad acne you might still be better with something that targets that specifically. Washing your face at the end of the day is so important even if you've already used a micellar water or face wipes as so much dirt and grime can build up in the pores. I love to wash my face using a flannel cloth as they're gently exfoliating so really help to remove any dead skin cells or blocked pores. I don't exfoliate everyday, however when I do - about twice a week - I always use the Liz Earle Gentle Face Cleanser. I find that this really helps brighten up my complexion without being drying or sucking out all of the moisture from my skin. Like all Liz Earle products, this one smells absolutely delightful and I would highly recommend it. Even if you have oily skin it's still really important to moisturise. I love the Liz Earle Skin Repair moisturiser - both the one for drier skin and the one for oily skin. I've been using them for over a year now and during the winter months I tend to stray towards the one for dry skin just to insure I'm getting maximum moisture. I've almost finished this pot at which point I'll be switching onto the one for oily skin, which suits me better in summertime. At the tender age of 19, I really don't have to worry about anti ageing just yet, however in my opinion, it's never too early! The eyes are the first area to show signs of fine lines and wrinkles, so recently I've been making an active effort to apply an eye cream. I love this No7 one as it's not at all greasy and soaks into my skin really well. It's also great as I have sensitive skin and this doesn't affect me at all. It also comes with a really handy nib like applicator so you can be really precise in only adding a tiny bit of product to your eye area. Whilst this is a step that I'm sure most people don't do everyday (myself included) if I'm feeling particularly tired, or just craving a really deep sleep, I like to apply the Temple Spa Aromatherapy Resting Cream. Back in the day I actually reviewed this on my blog, so if you're interested then I've left a link. Whilst this isn't something I would necessarily go out and buy, when I was given one by a hotel I thought I'd give it a go. It might be a placebo effect, but whenever I use this, I genuinely feel like I'm a lot better rested, and fall into a deeper sleep than usual. It has a very calming, almost herbal scent that is incredibly pleasant, and definitely makes for a nice evening treat! In terms of application, I tend to just sweep a tiny bit on my under eyes, right after applying my eye cream. And lastly, right before I get into bed, I like to just give myself a quick spritz of this freshness mist by Clarins. It just helps make me feel super fresh and clean, especially if I've washed my hair that evening. Obviously this doesn't really have a lot of benefits apart from making me feel really good about myself! Okay, thank you for reading! I hope you enjoyed this post and let me know what sort of things you have in your evening beauty routine! 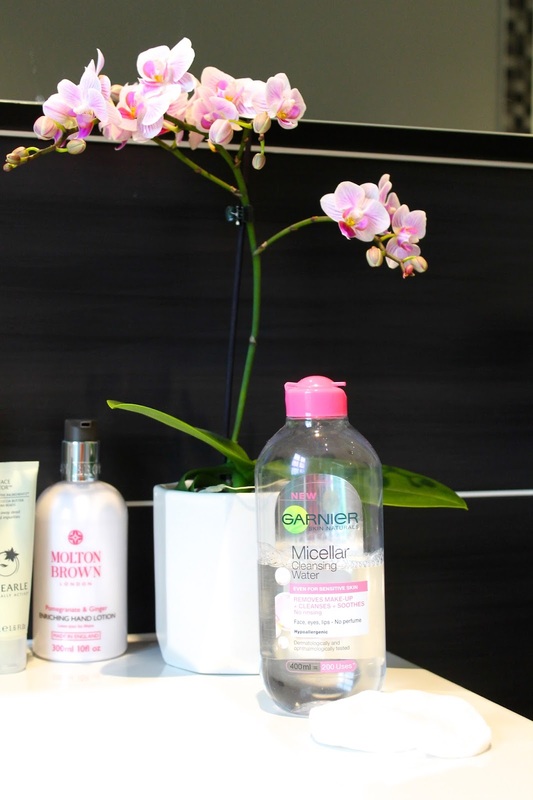 I've heard sooo many good things about the Micellar water, I need to try it out! The aromatherapy cream sounds fab, I use aromatherapy oils to help me sleep and I find them so effective! Sparkling In The Sunlight | Halkidiki, Greece. Beauty Review: L'Oreal Pure Clay Purity Mask. 3 Books To Take on Holiday. Lunch At Rushton Hall Hotel & Spa. Beauty Review: NYX Soft Matte Lip Creams. 5 Blogging Myths & Misconceptions! 3 Pink Lipsticks For Summer.